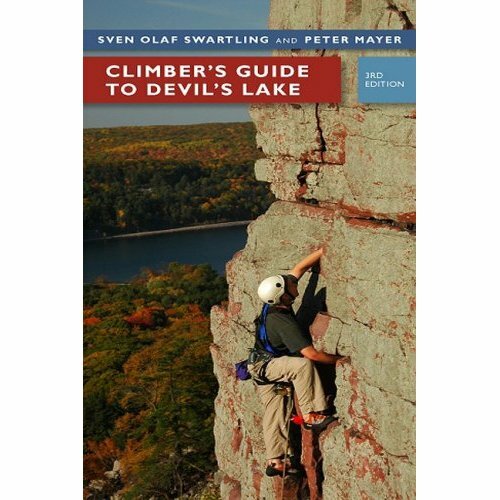 Climbers Guide to Devils Lake by Sven Olof Swartling and Peter Mayer is the must-have classic guide to rock climbing routes at Wisconsin’s Devil’s Lake. The book, which is in it’s third edition, details over 1800 climbing routes. Climber’s Guide to Devil’s Lake solves the problem of difficult to find climbing routes. If you’re planning on doing any climbing at the best location in the midwest you need this book! Climbers Guide to Devils Lake is organized by rock feature, with a helpful description of how to get to each one. Maps are also provided. Routes are organized by location with all of the routes on particular rock feature numbered and listed in order from left to right or right to left. Every route is described by number, name, rating and a brief one or two sentence description. For example, this is the description for the well-known route Cheatah: 125 CHEATAH, 5.10b. An exceptionally continuous route. Climb long crack that ends with a difficult layback (crux) near right corner. Some pictures are also included. GPS waypoints are included for each rock feature but not for routes. Who Needs Climber’s Guide to Devil’s Lake? Anyone who rock climbs at Devil’s Lake needs this guide. Whether you top rope or trad climb, finding routes at the lake can sometimes be a nightmare. This is especially true for those who are new to the lake or the sport. When I first started climbing at the lake I was constantly trying to figure out where I was and where the route was that I was trying to climb. Though Mountain Project and some other sites have great information on Devil’s Lake routes, there isn’t consistent phone coverage at the lake. When I tried to print information to bring with I often found that the routes that I had planned to climb were already taken and I had to find something else. Most of the time I didn’t have enough information on the routes that were available. Printing and organizing route descriptions became a problem. Climber’s Guide to Devil’s Lake solved these problems. It has well-organized information about nearly every route in the park. Not really. It would be nice to have a picture of every route but the book would have to be at least twice as long and it’s already over 300 pages. Some of the drawings could be bigger and it might be nice to have the height of each route or rock feature. Devil’s Lake climbers, you need a copy of Climber’s Guide to Devil’s Lake!